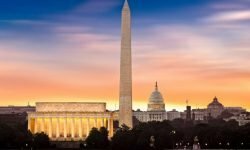 In late April 2017, the United States Census Bureau published a comprehensive set of updated economic statistics. 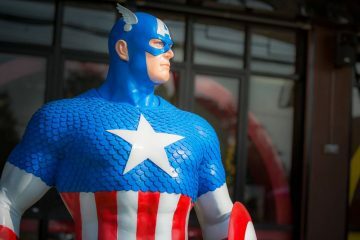 The data comes from the latest County Business Patterns, 2015 edition, which “provides the only detailed annual information on the number of establishments, employees…and annual payroll,” from national down to ZIP-code level, for nearly 1,200 industries. The updated Census Bureau data contains a wealth of information about US language services businesses. While the data fails to capture the turnover generated by individual freelance linguists (likely in the billions of dollars), who do not operate as a corporation, it still gives a very detailed picture of the country’s corporate language services sector. The data reveals that the industry’s total number of employees nearly doubled since 2008, rising from 15,484 in 2008 to 29,720 in 2015. From 2014 to 2015, employment growth stood at 6.58%, which puts language services among the top 15% in terms of job growth. 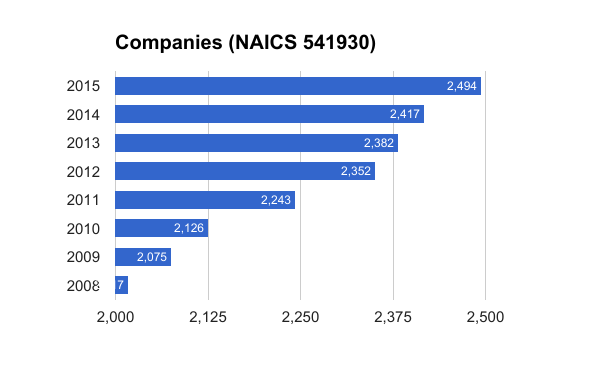 The number of companies under Code 541930 rose by 23.6% over eight years, from just over 2,000 firms in 2008 to nearly 2,500 in 2015. It is noteworthy that this data point goes against the widespread perception that the language industry is consolidating. 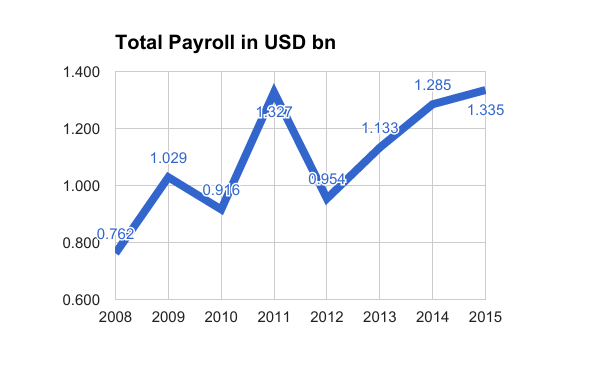 The US language industry’s total payroll rose from USD 0.76bn in 2008 to 1.33bn in 2015. Payroll has been on a moderate growth trajectory since 2008, however. The exception was 2011, which was a bit of an outlier (the data contains no indication as to why). 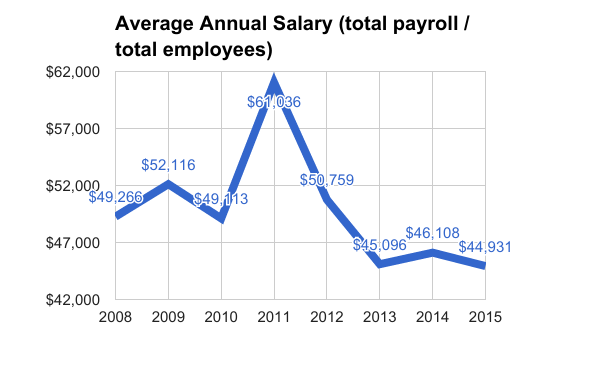 While the Census Bureau does not break out annual salary figures per employee, dividing the total payroll figure by the number of employees in a given year provides an interesting proxy for individual compensation. By that measure, the picture for the individual worker looks less rosy. Average annual compensation per employee dropped from USD 49,266 in 2008 to USD 44,931 in 2015. Again, 2011 was an outlier with compensation skyrocketing to USD 61,036; but that year appears to be a statistical fluke. 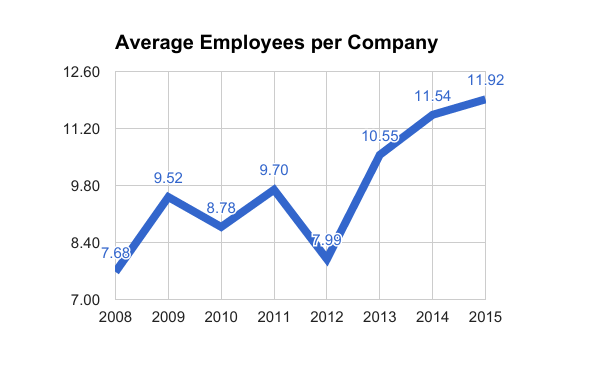 Another interesting data point is the average number of employees per company. 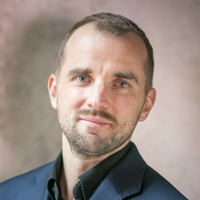 While the total number of LSPs continues to rise (i.e., the industry continues to grow but also fragment), the average number of employees per company is also on the increase. By that measure, at least, there is some consolidation. In 2008, the average LSP employed 7.68 employees. By 2015, that figure had risen to 11.92. Industry consolidation still has a long ways to go. 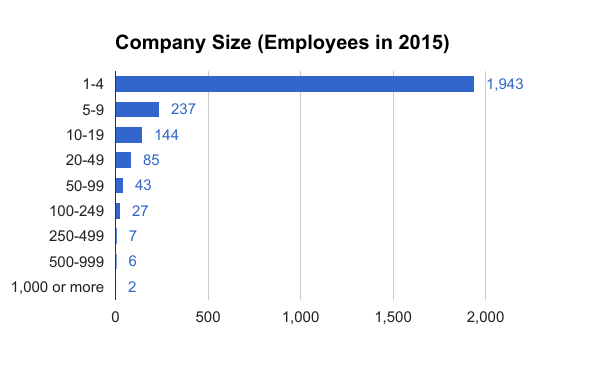 A full 77% of the 2,494 language service providers in the US are companies with less than five employees. At the other end of the spectrum, TransPerfect and Lionbridge are probably the two companies listed under the “1,000 or more” employees category. 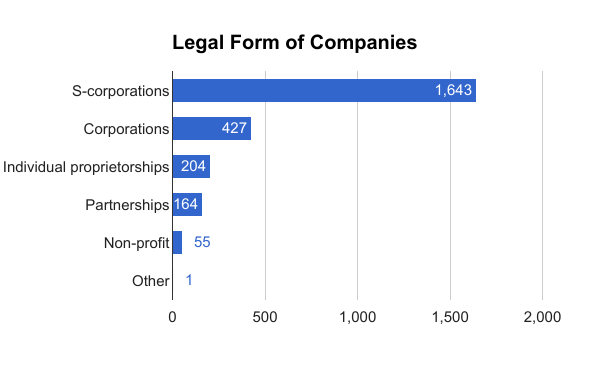 Finally, the most popular legal form among US LSPs are the so-called S-corporations, followed by corporations and individual proprietorships. Stay tuned as Slator further slices and dices the treasure trove of data that is the Census Bureau’s 2015 County Business Patterns.